Direct chat link – now shorter and way more flexible! Social Media are becoming more and more important in Customer Service. One of the reasons for that is the ability to send quick, short and straightforward messages via social channels. With that in mind, we have decided to make our Direct Chat Link shorter, so that you can blend it in with your Tweets or Facebook posts. 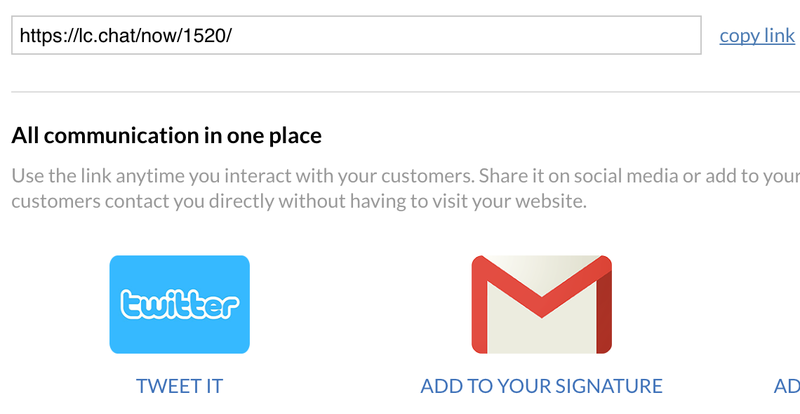 From now on, when you see your customers in need, simply grab the shorter direct chat link and post it on your Twitter or Facebook. Simple “Have a problem? Let’s chat now! https://lc.chat/now/1520/ “ can work miracles! Also, don’t forget to leave us feedback! Feel free to drop us an email anytime, at feedback@livechatinc.com.